For me the 2015 Oracle OpenWorld was a pleasant surprise. The surprise was not the announcement of an additional set of cloud products like the Identity Cloud or the Application Builder Cloud Service. The biggest surprise was the different tone of voice during the conference. In the past you could summarize Oracle’s message as: We are Bigger and Better in technology, Open Source is bad, Cloud is important, We (Oracle) Offer a full set of products and you do not have to look at other vendors. All your problems will be solved when you buy Oracle. 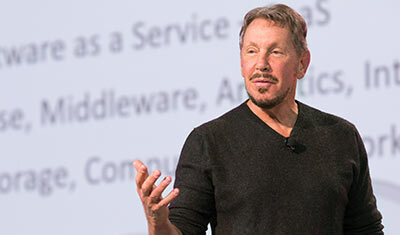 There is a change happening in Oracle, and the most important change is not the new products. Is a change in market approach, culture and structure. 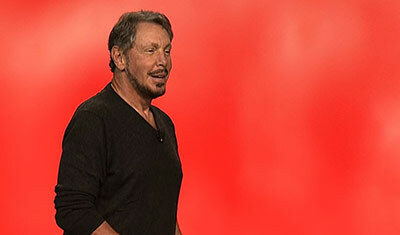 The change was visible in the Sunday and Tuesday keynote by Oracle’s CTO Larry Ellison. After a long time Oracle finally has a vision. And surprisingly it has nothing to do with technology. The vision steers Oracle in a completely different direction. Oracle needs to transform from a tech company to a services organization. It was definitely an inspiring keynote. The SAAS, PAAS, and IAAS business is taken very serious. I expected a full blown attack on Amazon and Salesforce, but Larry is seeing them as inspiring example. The CTO of Oracle seemed to have found his new horizon and he is eager to get there. He really looked like he enjoyed it again. Another change: Oracle is not so rigid anymore on the full stack solution. The “Oracle Only” message is replaced by the message: We need to make it easy for our customers to leave Oracle, and then keep them. Mentioning Amazon and Microsoft Azure as viable alternatives is a very strong message. IBM and SAP, the long term competitors of Oracle, are nowhere to be found in the cloud realm. Oracle does not pay attention anymore to these companies. Surprisingly these largest companies in the world do not play a role in the cloud industry. Oracle supports a wide range of options to run other (non- Oracle) applications in the cloud. 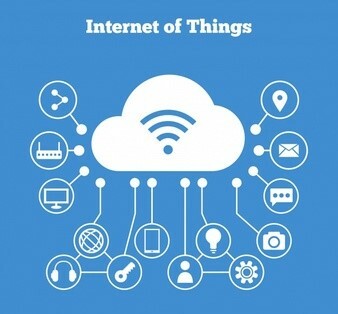 The goal is to offer the lowest prices for both acquisition and usage of Cloud products. Oracle is fully supporting Node.js, Ruby and Docker in the cloud. The collaboration with Bitnami (https://bitnami.com/) opens a wide range of open source product to be available for hosting on the Oracle IaaS. One important message I heard a couple of times: “this solution is good because it is based on open standards / is open source”. This obviously signals a change in direction. 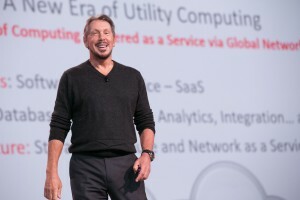 Oracle is becoming an utilities company. It needs to perform and it needs to be always on. Outage is not acceptable. Performance and security is built in the platform. When it is easy for customers of Oracle to leave their platform it becomes very important for Oracle to always delivery optimal service and availability. Same as we expect from water or electricity. The most important consequence of this change is their internal organization. The aim for Oracle sales is not focused anymore at the one time sale. It is focused on the consumption of their products. To keep their customers satisfied and using their platform. This means constant attention to quality and service. By introducing all these subscription based and metered services Oracle is forced to delivery better customer service. And that is a big change considering their history in this field (anyone who ever filed a service request with Oracle knows what I am talking about). Until now security was a service with lower priority to Oracle. I am not saying they ignored it, but security did made things a bit more complicated. Customers who bought security did not use it or where unable to configure it correctly. The new strategy is to push down the security in the lowest layers of the stack and to have it always on. “There should not be an off switch for security”. Using a lot of automation for operational jobs. For example patching and upgrading is much easier and the initial set up of the cloud instances is working with a lot of default settings. And since you are able to spin up additional compute instances when you need them and scale them down afterwards use you are faced with a reduced number of licenses (you only pay what you use). The past few years Oracle had a bit of an ambivalent attitude towards open source software. It was something they got with purchasing of Sun Microsystems. This year a lot of open source products where named and used in the Oracle stack. With the message: it is good because it is Open Source.. Tools like Jenkins, Mesos, Docker and the BitNami stack. (https://bitnami.com/stacks). Even support for running .Net on the Oracle Compute Cloud. The Fusion Application stack is complete. This took years of development. There was a huge emphasis on extending this stack with your own applications. And with the Application Builder Cloud Service this will become even more easy. Also integrating with other platforms and systems. Of course Oracle will deliver integration with large generic systems like Google and Microsoft365. And developers are able to write their own extensions and sell them via the Oracle Market place. So you can extend your Fusion Application even to non-oracle products. Until now this was very hard to do.And for Fusion Applications there is also the same message: Our customers do not want to be locked in.. Is must be easy for our customers to leave.. and we have to do our best to keep our customers. I think it still is going to take a while before the effects of these changes become visible for us normal users. Especially the organizational and cultural changes within the Oracle organization. But it is for a good purpose. Technology is only a means to achieve a business goal. We want our customers to achieve their goals. And only by operating in this way Oracle is able to change their market and internal structure. Being able to change the internal Oracle organization is going to be the toughest job of all. Watch the two keynotes by clicking on the image below. Robbrecht van Amerongen is Business Innovation Manager at AMIS Services. He has a vast experience in managing software development and delivery projects and growing the development unit of AMIS. He is able to utilize new technologies and methodologies to valuable products and services for his customers. His expertise lies in all aspects of software engineering; ranging from continuous delivery, provisioning, cloud computing, user experience and wearables.Robbrecht is also an Agile coach and Certified Agile Master. He has experience in managing Agile projects with Scrum (first with DSDM) ranging back to 1999. Robbrecht is a strong proponent of the agile principles. Robbrecht is agile examiner for the agile foundation, practitioner and master certificate. Robbrecht van Amerongen is Business Innovation Manager at AMIS Services. He has a vast experience in managing software development and delivery projects and growing the development unit of AMIS. He is able to utilize new technologies and methodologies to valuable products and services for his customers. His expertise lies in all aspects of software engineering; ranging from continuous delivery, provisioning, cloud computing, user experience and wearables. Robbrecht is also an Agile coach and Certified Agile Master. He has experience in managing Agile projects with Scrum (first with DSDM) ranging back to 1999. Robbrecht is a strong proponent of the agile principles. Robbrecht is agile examiner for the agile foundation, practitioner and master certificate.